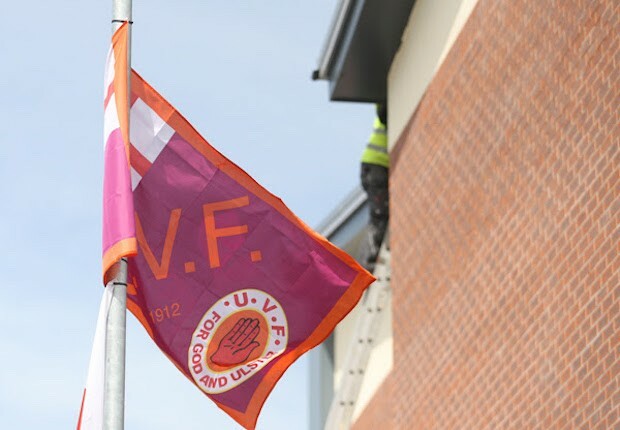 IN SCENES REMINISCENT of the pogroms and expulsions of Catholic families from their homes in east Belfast during the 1970s, four Catholic families were forced from their homes in Cantrell Close by the UVF the week before last. Cantrell Close is a collection of newly-built houses that sits off Ravenhill Avenue, which links the Ravenhill Road in south Belfast to the Woodstock Road in east Belfast. Many Catholic families were forced to leave this area in the early 1970s due to sectarian intimidation. That reality was meant to be behind us – part of our historyrather than our present. Cantrell Close was intended to be different. It was intended to symbolise what the vision of a shared future in the North should look like. Cantrell Close was built by a housing association with financial support from the Northern Executive as the first shared neighbourhood development scheme under ‘Together: Building a United Community’. 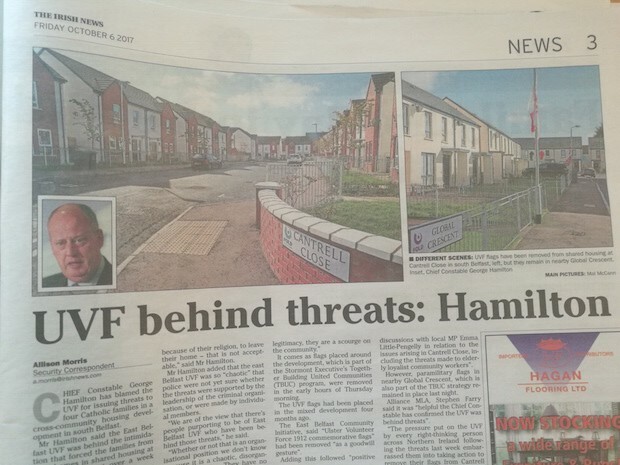 As a result of this blatant sectarian intimidation, questions now arise for the PSNI, the Housing Association and in relation to the criteria for funding shared neighbourhood schemes. 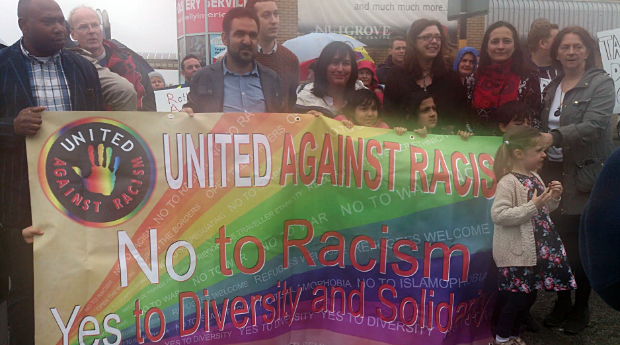 The collective condemnation of this incident by all main parties was a very positive demonstration of united leadership. That now must be built upon. The reality is that this sectarian intimidation against the families at Cantrell Close is not happening in isolation. During August, a series of violent sectarian attacks were targeted against Catholic homes in Derry City. In Antrim Town, in my South Antrim constituency, there has been a renewed proliferation of unionist flags, specifically outside a Catholic church and primary school and at the entrance to the Tesco supermarket. Other mixed population areas continue to be festooned with unionist flags. These flags are designed to intimidate, offend and increase community division. The sectarianism which perpetrates such actions is endemic in our society. It is a blight on the societal and political landscapes of the North of Ireland. Sectarianism and segregation influence our society’s approach to educational preference: choice of sport, how and where citizens choose to live and socialise, and (to some degree) defines the location of their employment. Unless the attitudes that sponsor and perpetuate the nature of division and conflict are eradicated and resolved, the culture of ‘Them’ and ‘Us’ will continue to recycle divisions. 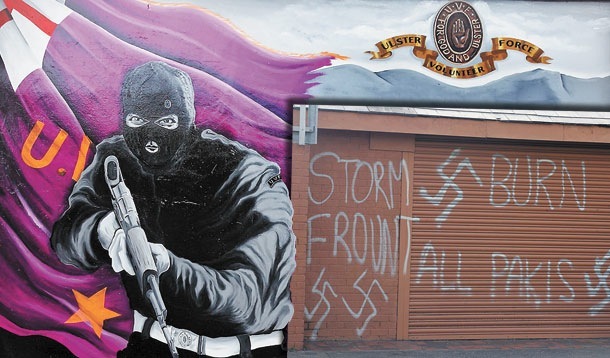 The continued denial of rights for Irish-speakers and their families and demonisation of the Irish identity and Irish way of life in the North has been fuelled by the incendiary language of ‘cultural war and supremacy’. This creates the environment which makes it acceptable for ‘Them’uns’ to be dehumanised and to be viewed and treated differently. The sectarian intimidation of the families from Cantrell Close is a direct consequence of such bigotry. The Good Friday Agreement set out the political framework and governing principles to enable the peaceful co-existence of our society’s contested political identities and aspirations and different cultural traditions. However, the failure of political unionism in particular to fully embrace the Good Friday Agreement principles of mutual respect, parity of esteem and equality mean that the culture of sectarianism has undermined the primacy of democratic politics. Sectarianism is the antithesis of Irish republicanism. Sinn Féin is fully committed to tackling and eradicating sectarianism from Irish society – regardless of the source. · The duty to report or challenge sectarian speech, attack, intimidation or other discrimination when witnessed or heard. True democratic politics, free from sectarian culture or attitudes, need to work and be seen to do so successfully within our institutions, under the agreed and binding principles of the Good Friday Agreement. Public representatives and political leaders must set the example and desist from language or actions which offend against the identity of anyone in this society. That is why the collective condemnation by parties of the Cantrell Close threats is so important. Sinn Féin believes anti-sectarianism measures and initiatives must be embraced by the institutions and mechanisms of government at both Executive and local authority levels. 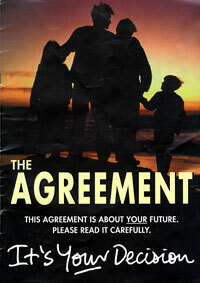 Sinn Féin has used every forum to table anti-sectarianism proposals for agreement. Our party has consistently argued that anti-sectarianism should be central to a rights-based society and government in the North. We have proposed there should be a clear legal definition of sectarianism as a hate crime and enshrined within legislation. This should be given expression within a Bill of Rights. However, the DUP and political unionism are opposed to this approach and so, to date, there has been no progress in getting agreement on these priorities. The DUP’s consistent rejection of the rights and equality agenda (alongside that party’s association with a series of financial scandals) directly caused the collapse of the political institutions in January this year. Rights belong to us all. Everyone has the right to live free from sectarian harassment and discrimination. Sectarianism and the denial of rights is the most direct and serious challenge facing this society and the political process. There is no acceptable level of sectarianism. It is unjustifiable. Every section of our community must unequivocally demonstrate zero tolerance of sectarianism from all quarters. Political, civil, church and community leaders need to speak out with one voice against sectarianism, just as they have rightly done so in the past against racism. We need a popular community campaign to eradicate sectarianism in all its forms and to isolate and fearlessly shun those extremists who continue to fuel and feed off sectarian hatred. It is time for a #SUAS campaign.